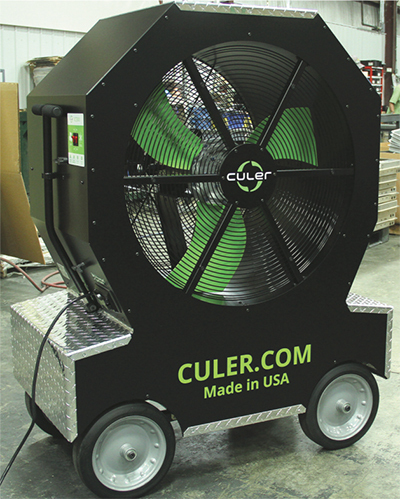 Quality Industries, Inc. (QI), LaVergne, TN, received the 2015 Higgins-Caditz Design Award for its redesign of the Culer XC3000 atomizing evaporative cooler. QI employs 500 people, servicing the heavy-transportation, alternative-energy, electrical-enclosure, and towing and recovery-equipment industries. QI manufactures the newly redesigned cooler with a combination of off-the-shelf components and custom-fabricated metal components, including more than 150 separate line items. Most of the fabricated components are manufactured inhouse at QI using CNC punch presses, lasers, press brakes, CNC milling machines, arc- and spot-welding machines, and a powder-coating system. Assembly takes place on a custom-built line designed, fabricated and installed by QI personnel. 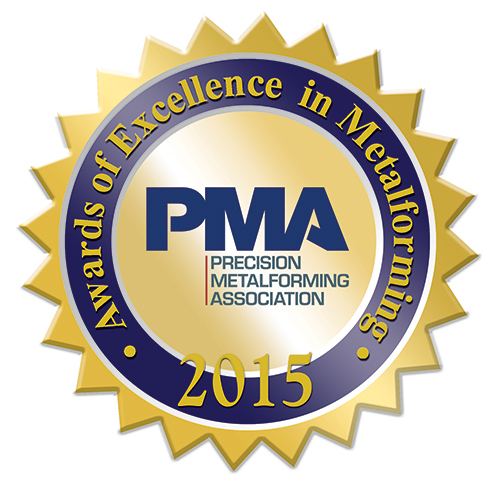 Does Your Metalforming Company Deserve Recognition in 2016? Share your success—and brag a little—by submitting an entry for PMA’s Awards of Excellence in Metalforming 2016. It’s your chance to recognize employees and earn industry recognition. To learn more, visit www.pma.org/awards, or contact PMA’s Christie Carmigiano at 216/901-8800, ccarmigiano@pma.org. • Integrating an air tank into the system to provide air to the atomizers during shutdown, eliminating approximately $80/fan. As a result of the design changes, year-to-year sales have increased dramatically—purchase orders have increased by 10 times compared to the previous year, and sales are projected to increase 20-fold by year-end. In addition to increased production, cost-saving design improvements have yielded an 18-percent decrease in total unit cost. The Design Award was created by the Worcester Pressed Steel Co., Worcester, MA, and is sponsored by The Quarterly Club. Excellence in Product Development—Trans-Matic Manufacturing Co.
Trans-Matic Manufacturing Co., Holland, MI, received the 2015 Ulbrich Award for Excellence in Product Development, for developing and deep-drawing two new canister parts for an engine-powered electrical generator. Trans-Matic provides engineered deep-drawn metal stamped components, value-add mechanical assemblies and proprietary products to many markets. In addition to the Michigan site, Trans-Matic operates facilities in Mesa, AZ, and Suzhou, China. 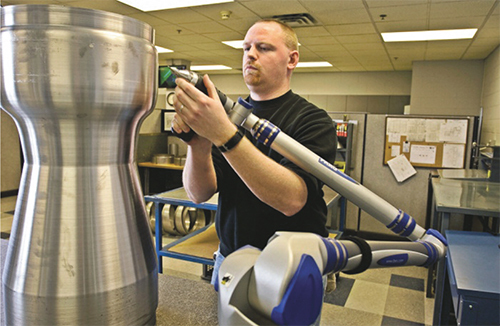 Trans-Matic was approached in March 2013 by its customer, Qnergy, to stamp small canisters from Haynes 230 superalloy (nickel, chromium, tungsten and other metals), not normally deep-drawn. Trans-Matic engineers ran several computer forming simulations, and then, working together with experienced toolmakers, developed a feasible and optimal forming methodology for the parts. Your winners of the PMA 2015 Awards of Excellence in Metalforming—winners received a plaque, commemorative flag and cash prize. PMA also presents The Training and Education Award, for which there was no winner in 2015. The award, sponsored by HPL Stampings, Inc., Lake Zurich, IL, in memory of A.R. (Ray) Hedberg, a leader in employee training, recognizes outstanding achievement by a PMA member company in employee technical education through a comprehensive training program. The original canister design comprised three parts—a tube and two end caps. The end caps were machined from solid Haynes bar stock and then welded to the tube. The three-piece, two-weld design proved expensive, considering each Stirling engine includes 80 of the canister assemblies. Working with Qnergy, Trans-Matic altered the design to feature two deep-drawn stampings (one with a draw-to-diameter ratio exceeding 4:1), completed in the press and then joined with one weld at the customer. Initially, Trans-Matic used high-strength carbide tooling to form the longer filter canister, but the carbide tended to damage the part surface and open the grain structure. The Haynes material also proved very abrasive for the tools. When die designs were revised to include new specialized ceramic die components, scoring and grain elongation were minimized while tool life improved. For the prototype phase, the Haynes material was purchased in 4- by 8-ft. panels, sheared to strip width and welded together to form a coil. The panels exhibit better dimensional and physical properties than material supplied as coils. With the shorter cold-transition canister, punch wear did not present a problem for the low-volume prototype runs. However, once production runs began, punch tooling wore significantly after only a few thousand parts. 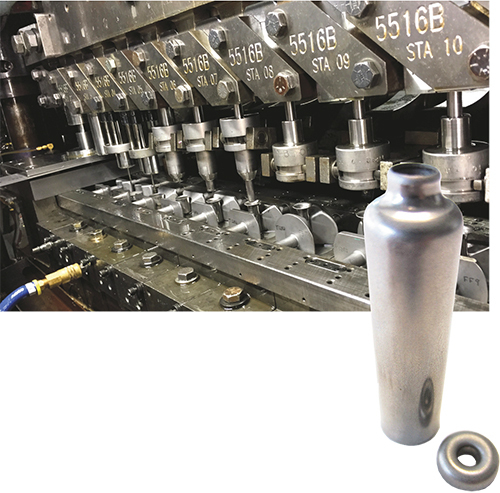 Trans-Matic investigated special lubricants and coatings, and ultimately decided to treat the M4 punches with a coating specifically designed for abrasive materials. Production of the filter canister occurred in a 16-station tool (13 stations for form and trim, plus an idle station and stations for leak testing and exit) running on a 551 Baird 75-ton transfer press. To manufacture the cold-transition canister, a 12-station tool ran on a 12-12 Waterbury 30-ton transfer press. The new canisters provided Qnergy with a 44-percent cost savings by moving from three parts with two welds to two deep-drawn parts and one weld. The new design also improved dimensional stability and durability. The Product Development Award, sponsored by Ulbrich Stainless Steels and Special Metals, Inc., North Haven, CT, acknowledges a manufacturing company that demonstrates outstanding innovation in developing and manufacturing a product that best uses metal in place of a nonmetal competitive material, or that develops a product using flat-rolled material that was previously manufactured using more costly manufacturing processes. Excellence in Safety—Trans-Matic Manufacturing Co.
Trans-Matic also received the 2015 Pitcher Insurance Agency Safety Award, for sharing its lessons learned and the safety improvements made after a fire occurred in its Holland facility. In March 2014, an inline water heater used to preheat water for a parts-washing line overheated, resulting in heavy smoke and a small fire in the pressroom. The Trans-Matic team responded to the emergency, evacuated the building, called the fire department and extinguished the fire. All employees were accounted for after reporting to their designated meeting areas. Although there was heavy smoke, there was only minimal damage to the building and no injuries. However, an investigation revealed that there was the potential for a much more serious event and an opportunity for lessons to be learned and applied. Trans-Matic conducted a thorough investigation to determine the root cause and corrective actions. The team discovered that the water heater (with a 72,000-W heating element) was not designed for a standalone application as installed by Trans-Matic. Rather, it was designed to be part of a larger assembly and was therefore not equipped with important safety devices. These include sensors to monitor in and outflow, temperature limits and pressure. Trans-Matic, unaware of this fact, assumed the heater could be installed as-is. The investigation also found that Trans-Matic lacked the expertise to select and engineer such a system without outside help. As a result, the Trans-Matic team revised its safety review-process to include outside expertise when necessary. This expanded safety review now is required for all new machines, equipment, processes and structures when the technology is new to Trans-Matic. The safety-review process requires the signoff of a qualified expert for any new design, equipment or process under review. In addition, a safety-approval tag remains affixed to any new machine until the completion of installation and final reviews by maintenance, engineering, production and safety. With its new safety-approval process in place at its Michigan and Arizona facilities (with plans to implement at its facility in Suzhou, China, by year-end), Trans-Matic also applied the process to existing installations, to reveal any hidden accidents waiting to happen. During this review, it discovered two installations that required outside expertise—new work-in-process storage racks, and an inhouse part-coating process. Trans-Matic has an outstanding safety record and has received MSHARP certification from the state of Michigan, awarded to companies committed to developing and maintaining effective safety and health systems. The water-heater incident helped Trans-Matic, a company with a strong safety program, to become even stronger. The Safety Award, sponsored by Pitcher Insurance Agency, Chicago, IL, acknowledges either an effective comprehensive safety program or a specific innovative idea in the context of an effective safety program. Highlands Diversified Services (HDS), London, KY, received the 2015 Zierick Manufacturing Corporation Productivity Award. The company specializes in metal stamping, secondary operations, powder painting and assembly, serving the automotive, appliance, telecommunication, aerospace and office-equipment market segments. HDS won the award for productivity improvements related to a satellite-dish assembly fabricated for a telecommunications company. Company management reviewed the entire process surrounding the assembly (including a satellite dish, mounting base and support arm) from stamping to packaging, and made improvements across the board. HDS first created a staging area dedicated to the satellite-dish assembly, located close to a paint-line and reducing the time spent by a forklift driver handling associated totes of stamped parts throughout the 85,000-sq.-ft. plant. This staging method frees press and paint-line personnel from being dependent on a forklift. Now, totes move to the paint line via a manual pallet-jack. This has resulted in a 25-percent labor reduction per shift and has reduced the risk of accidents. 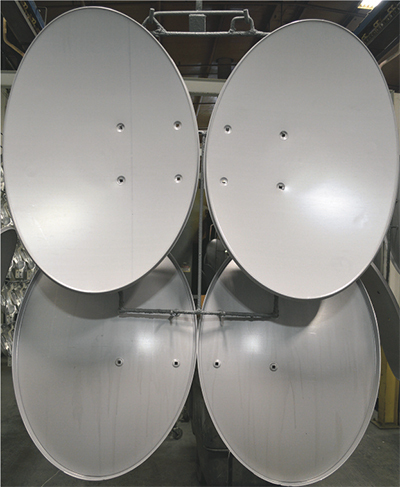 Also, stamped satellite dishes previously were placed on paint racks that held only two dishes; HDS redesigned the racks to hold four dishes, doubling throughput. 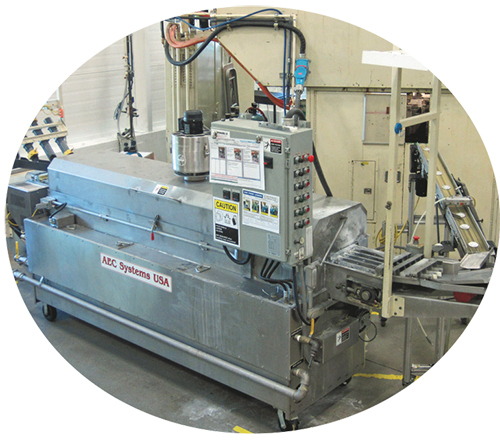 Before putting the improvements in place, HDS had been packaging the assembly components on a manual line, completing 228 skids/shift. To decrease labor requirements, it installed two robots at the end of the line to place the assembly kits on pallets. It also added a Lantech stretch-wrapper to eliminate the need to manually wrap the pallets. All told, the new packaging process resulted in 25-percent decrease in labor, and enabled a 5-percent increase in throughput (240 skids/shift). The Productivity Award, sponsored by Zierick Manufacturing Corp., Mount Kisco, NY, recognizes outstanding achievement by a manufacturing company in the development and implementation of programs, processes and use of assets that lead to significant improvements in productivity. Schoolcraft College, Livonia, MI, received the 2015 Clips & Clamps Industries Educational Institution Award, recognizing its outstanding manufacturing programs designed for students seeking 21st-century skills based on today’s manufacturing environment. Educational programs at the school cover middle-school and college students, and industry workers. Schoolcraft College has a well-established Industry Advisory Committee that has been active for more than 15 years, with a dozen companies participating at the most recent meeting. The school acts on the committee’s recommendations and as a result has developed and implemented a geometric dimensioning and tolerancing (GD&T) course. It also is working to add NIMS accreditation into its programs; has helped companies set up apprenticeship programs; and has developed curriculum for new internship courses in advanced manufacturing and welding. The college, along with the Livonia Chamber of Commerce and Plymouth Chamber of Commerce, works directly with local industry through the Livonia Industrial Council and the Plymouth Manufacturing Council. This partnership of educators, businesses and policymakers focuses on growing a skilled and high-tech workforce. In addition, local businesses have donated time and machines to its manufacturing department. Under the leadership of Gene Keyes, head of the advanced manufacturing department, Schoolcraft College has aggressively tackled the challenge of developing new skilled metalworkers, by updating curriculum and pursuing NIMS accreditation. 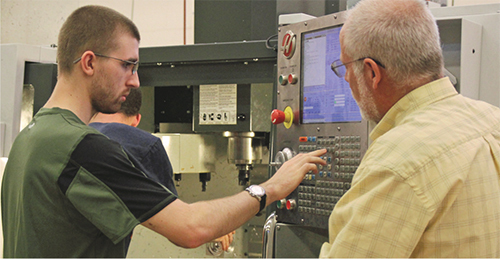 Beginning with the 2014-2015 school year, students were able to acquire NIMS certification from the college’s advanced manufacturing programs. Also, in an effort to expand NIMS credentials in Michigan, Schoolcraft College hosted a week-long workshop for manufacturing instructors to help them better understand NIMS credentials. A total of 73 credentials were earned, 30 of which were from Schoolcraft faculty and students. Schoolcraft College actively reaches out to the community, introducing parents and students to the world of manufacturing and machining. The department works with the local K-12 teachers and administrators to develop a career path from middle school to college, then onto jobs, highlighting opportunities in the manufacturing workforce. The school also recently hosted its second annual openhouse in the Advanced Manufacturing Lab, allowing more than 200 students and parents to tour the lab and campus. The Educational Institution Award recognizes a public or private educational institution that provides outstanding training and education services to companies in the metalforming industry. The award, sponsored by Clips & Clamps Industries, Plymouth, MI, is funded by the Dul Foundation. Clips & Clamps Industries and Fox Hills Golf & Banquet Center, through the Dul Foundation and the families of Michael and Kathleen Aznavorian, Douglas and Sandy Mily and the late Estelle Dul, proudly support the efforts of the PMA Educational Foundation. Kryton Engineered Metals, Cedar Falls, IA, received the 2015 Pridgeon & Clay Excellence in Quality Award. The company fabricates spun metal components and other parts, and features a bevy of fabricating equipment including a new Cincinnati flat-bed fiber-laser cutting machine and Rofin five-axis laser-cutting machine. Kryton’s quality system includes executive management commitment and management review, as well as software enabling paperless shopfloor data entry and real-time interaction. Also noted is a dedication to team-member training and education, customer partnerships to reduce nonconformance, and preventive action. Kryton management reviews all activities relevant to ISO certification requirements. Quality staff presents to management a monthly operations report that includes detailed information and charts on all aspects of the operations, including customer on-time delivery, PPM ratings, shipments and scrap. All Kryton employees receive the report via e-mail, and have access to pertinent charts shared through electronic message boards throughout the facility. Kryton’s ERP software, which features paperless shop data entry and real-time interaction, automatically generates at the conclusion of each operation a move ticket that shows the step completed and the next step required. Scrap tags also are printed immediately upon nonconformance, so that material is identified and quarantined. This system also allows for a Cause and Corrective Action or Internal 8D to be issued if needed. As a result, Kryton has realized a dramatic scrap reduction. Kryton also offers an education/tuition-reimbursement program for employees, and onsite and offsite training. The company has five team members bronze-certified in lean manufacturing, one team member who is a Certified Lean Six Sigma Blue Belt and another who is a Certified Lean Six Sigma Green Belt. The Quality Award, sponsored by Pridgeon & Clay, Inc., Grand Rapids, MI, recognizes outstanding achievement by a manufacturing company in the development and implementation of a company-wide quality system that effectively uses continuous improvement. Excellence in Process Control–Zierick Manufacturing Corp.
Zierick Manufacturing Corp., Mount Kisco, NY, received the 2015 Link Systems Process Control Award. Zierick serves numerous markets with emphasis on industrial controls, automotive, HVAC, solid-state lighting, medical and security. Zierick won the award for its Surf-Sert Autotaper, for production of surface-mount-technology components, designed and built inhouse to reduce the production cycle and minimize cost to its customers. Air cylinders, solenoid valves and a stepper motor are used for feed, cutoff, positioning and insertion processes. A programmable logic controller (PLC) and numerous sensors enable process automation. The machine also relies on a stepper drive, two power supplies, circuit-protection mechanisms and a pushbutton control panel that eventually will be replaced by a human-machine interface (HMI). Maintaining repeatability of carrier-tape positioning presented a significant challenge to Zierick’s design team. The tape is positioned using a stepper motor with a 20-tooth sprocket. The sprocket teeth engage the pilot holes of the carrier tape in a similar way that many tape feeders do. The plastic carrier tape is vacuum-formed which dictates rather generous tolerances. If the position of the tape is slightly off, it can cause the part to become lodged into the cavity. To avoid this type of insertion error and others, the team added a thru-beam sensor to detect tape position. The thru-beam transmits through a single pilot hole in the tape. The PLC program sends pulse signals through a stepper drive to a stepper motor, causing it to rotate in 0.018-deg. micro-step increments. This pulsing occurs until approximately 80 percent of the transmitted light is received by the sensor and the other corresponding I/O conditions are met. The machine program stores on a Panasonic FPX series PLC. A combination of standard IEC-61131-3 sequential function charts and ladder logic control machine operation. The program controls all standard operations and also allows for the machine to respond to several different circumstances and continue running without human intervention. Use of the PLC also reduces setup and reload times, by automatically leading-in and trailing-out the tape reel with the correct number of unpopulated cavities, as required for the customer’s pick-and-place machines. 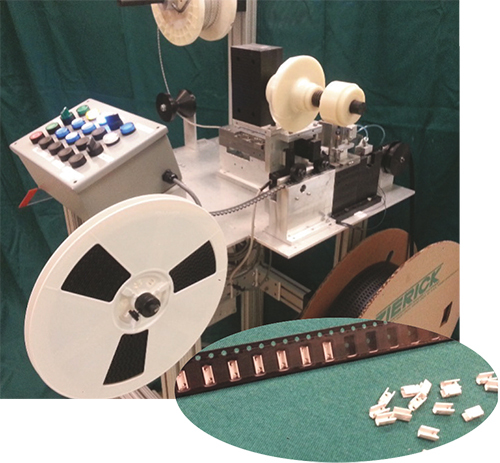 The machine can detect when a part fails to fully insert into the cavity of the tape. If this situation arises, the machine will take a corrective action by actuating an insertion plunger above the cavity that helps move the part down into the bottom of the cavity.